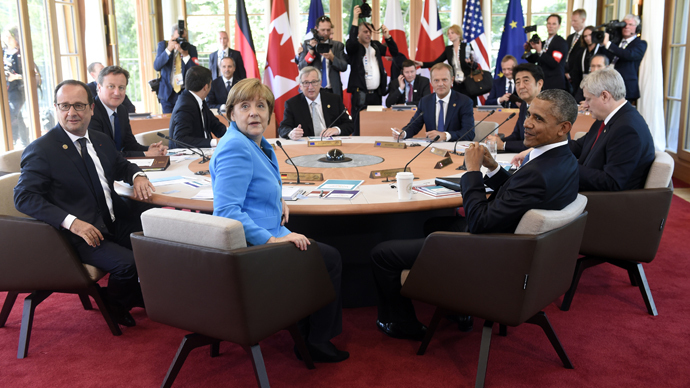 The two-day G7 summit has kicked off in Bavaria as its leaders gathered to discuss hot-button issues such as Ukrainian crisis, with some voicing support for tougher Russia sanctions despite the economic difficulties they bring to the EU. He also backed tougher sanctions against Russia, hoping that it would be put in place at the end of this month at a meeting of EU leaders in Brussels. "If anyone wants to start a discussion about changing the sanctions regime, it could only be about strengthening it," Tusk said. Tusk was joined by British Prime Minister David Cameron, who urged EU leaders to stay united on upholding Russia sanctions despite the pain they cause to the bloc. "[Sanctions have] an impact on all countries in terms of putting sanctions on another country. [But] Britain hasn't let our preeminence in financial services get in the way of taking a robust response to Russian-backed aggression and I don't think other countries should either," Cameron said. At the summit, German Chancellor Angela Merkel and US President Barack Obama held a tet-a-tet meeting before discussing how much they had enjoyed an al fresco Bavarian meal. Investigative journalist Tony Gosling told RT that it seems Western politicians are being driven by the US into rhetoric about uniting against Russia. The recent escalation of violence in Ukraine has prompted fears that the fragile ceasefire agreed in Minsk in February could break down. The residential areas in eastern Ukraine have been shelled in recent weeks resulting in civilian casualties. Organization for Security and Co-operation in Europe (OSCE) monitors have reported violation of the Minsk ceasefire agreements by both sides of the conflict. Moscow has called on Western states to urge Kiev to make all efforts to stick to the Minsk agreements. At the UN Security Council meeting on Saturday, Russia’s UN envoy Vitaly Churkin noted that there has been frustration with Kiev’s “flagrant violation and blunt ignorance of the Minsk agreements” among Western states. Among other issues dominating the G7 talks in Bavaria is the Greek debt crisis. European Commission President Jean-Claude Juncker has said that a Greek exit from the euro currency is not an option, but cautioned Greek Prime Minister Alexis Tsipras against distorting proposals by international creditors for a cash-for-reform deal to save Athens from default. The two-day summit is also expected to focus on tackling terrorism and global warming. The summit has been met with mass demonstrations by anti-capitalist and anti-globalization protests in several Bavarian cities. The protests started ahead of the summit’s launch on Saturday, while thousands of riot police have been deployed to the rally locations. Police have used tear gas against anti-G7 protesters in the town of Garmisch-Partenkirchen. The real reason the G7 is considering toughening sanctions on Russia may have little to do with the current crisis in Ukraine. Political commentator Caleb Maupin thinks Russia’s emergence as a major player in the international oil and gas markets has prompted big corporations and major financial interests to push politicians to exclude Russia from this year’s summit and ratchet up the pressure. “It’s a threat to the global hegemony of the big bankers on Wall Street and in London, and they very much want to keep control of the global markets,” Maupin said in an interview with RT. “I don’t think the reason Russia was excluded [from the summit] has anything to do with Ukraine, I think it’s about continuing to put pressure on Russia, continuing to isolate Russia,” he added. While this policy may serve the interests of US and UK elites, it isn’t to the benefit of most European countries, Maupin went on to say. “Germany and many other countries throughout Europe are basically being forced to work against their own interests in order to help the United States,” he said. Some government officials in these countries have become fed up with the situation, according to Maupin. It is not only Europeans who suffer from the misguided approach to Russia. The working people of the US and the UK, where, despite claims to the contrary, the economies are yet to recover from the Great Recession, also gain nothing from the sanctions on Russia. “The only people who are benefiting from this campaign of Russophobia and hatred, hatred for Russia; the only people who are benefiting are a small group of wealthy bankers,” said Maupin.